The QVW173-PAC delivers an affordable quad-view/switcher solution that can be used for any multi-camera live broadcast and/or video production. The QVW173-PAC can also be used to monitor one single 4KUHD source. 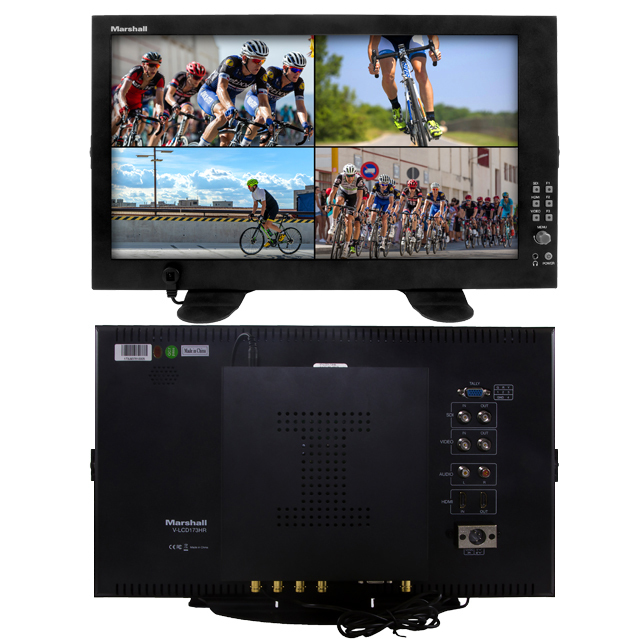 VMV-402-SH attachedThe QVW173-PAC combines two highly efficient Marshall products, the V-LCD173HR and the VMV-402-SH, to provide users with a powerful quad-view display solution at a fraction of the cost of similar quad-view systems on the market. The QVW173-PAC delivers a full broadcast-quality (1080 x 1920) quad-view display that can also act as a 4-input switcher, allowing seamless transitions from up to four media sources. When used together, the QVW173-PAC package allows users to mix and match any combination of video inputs, including non-broadcast computer (VESA) resolutions, to a preselected resolution and frame rate. Each quadrant is also rescaled and reframed for optimal monitoring. With full active throughput, the VMV-402-SH provides picture-perfect seamless upstream switching, which can add years of life to smaller production systems comprised of switchers with limited inputs. If progressive formats are used, the VMV-402-SH's integral scalers are even capable of flawless 4KUHD transformation for 4K streaming and projection of a single image. The QVW173-PAC is a true studio upgrade at a fraction of the cost of a single switcher.